Researchers often make appointments to visit St George’s Chapter Library in order to inspect a book for annotations made by its past owners and readers. Marginal notes provide insight into the interests and opinions of people long since gone. They are evidence of a book’s use and reception, giving unique and sometimes very informative context to a volume’s contents. 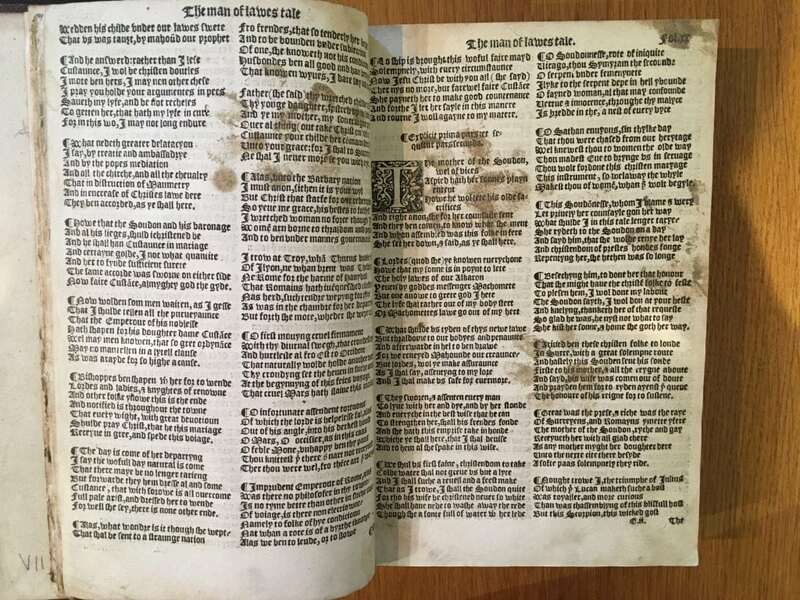 However, a recent visitor who came to examine a 1542 edition of the works of Geoffrey Chaucer [SGC RBK C.185] was surprised and delighted to find a much less common sign of life – this row of paw prints through the middle of the Man of Law’s Tale. The prints are 7cm long and 6cm wide, which suggests they were made by either a very large cat or a small-medium sized dog. Wherever a careless reader had left the book, the animal appears to have wandered across it with either inky or muddy paws. It is not possible to date the paw prints only by sight, but staff are confident that they cannot have been made in the last twenty years when the Chapter Library has been held in secure storage in the Vicars’ Hall Undercroft. Geoffrey Chaucer is renowned as a great poet and writer, particularly for writing in his native English language rather than the more scholarly Latin. For this reason he is considered by many to be the father of English Literature. In a less well-known chapter of his life, Chaucer served as Clerk of Works at Windsor Castle and in 1390 oversaw repairs to St George’s Chapel. The Man of Law’s Tale is the fifth in the famous collection of The Canterbury Tales, which records stories that Chaucer imagined being told by a group of pilgrims as they journeyed to Canterbury to visit the shrine of St Thomas Beckett. The Man of Law is a judge in the court of assizes; he is wealthy, educated and dignified. He entertains his fellow travellers with a morally uplifting tale about the daughter of a Roman emperor who is sent to Syria as a bride but is forced to flee the Sultan’s court because of her Christian faith. She travels widely and endures many trials in subsequent years before settling in Northumberland, where her son later becomes king. Chaucer’s tales were written in the late fourteenth century; about one hundred years before printing press technology began to be used in book production in Britain. The Canterbury Tales was in fact one of the first books turned into print by William Caxton, the first man to establish a printing press in London. This sixteenth century edition of Chaucer’s works is proof that there remained an appetite for his writing long after his own lifetime.